The Saturday before Christmas, Rich and I watched Hector and the Search for Happiness, a movie starring Simon Pegg who plays a psychiatrist stuck in his daily routine for which he experiences little happiness. He sets out on odyssey to unearth what makes people happy. By the end of the film, he’s experienced fear, elation, wonderment, and many unexpected adventures, which lead him to the path of happiness and contentment. The film is worth watching in that my saccharine description glosses over his journey across several continents, people he meets, and lessons he learns. For our recent trip to Bullhead City, Arizona, I decided to take notice of the genial people we encounter, and harvest their zeal, optimism, and outward happiness. Early Sunday morning, we boarded a shuttle at the Bellingham International Airport. The driver was jovial, sharing that he had five daughters (two were twins), nine grandchildren, and two great-grandchildren. He laughed, recalling the many pranks he’d played on them, including insisting a large, gaudy-painted sphere was an alien egg. He commented that one of his daughters still displays the “egg” on her mantel, and eagerly tells visitors how her father tricked her as a kid. His favorite prank, which he’s been reenacting for his grandchildren, is using wire ties to secure bananas to his cherry tree. He then invites his grandchildren to harvest the bananas, confirming his tall tale that cherry trees can indeed grow bananas! We wished him a merry Christmas, and the joy of dreaming of new antics to entertain his daughters’ children. As we went through the security line at the airport, we commented to the TSA agent it’s a pleasure flying out of Bellingham with short lines and easy parking. The agent added the security personnel are also nicer. While they’re certainly nicer, Rich had to go through additional security screening because he left his wallet in his pants pocket when he went through the body scanner. Our flight to Las Vegas was pleasant. Halfway through, we struck up a conversation with one of the flight attendants, a 26-year old woman who said her job is super fun, and that I should consider becoming a flight attendant. I was sold after she told me the oldest person in her class was 68, training is just 5 weeks in length, the benefits are great, and after a year, you can choose how much you want to fly. The drawback is that I’d need to commute to Seattle, which is one of Alaska Airline’s bases. Julie the flight attendant? Maybe. After landing in Las Vegas, we drove to Laughlin and Bullhead City, which are on opposite sides of the Colorado River, straddling the Nevada and Arizona borders. After seeing Rich’s step-father, enjoying Mexican food, and settling into our room at the Tropicana in Laughlin, we walked to a quickie mart for soda and nibbles. Two women were behind the counter. One was an older woman. The other, a younger, heavy-set woman with a man’s haircut. No doubt, working at a quickie mart isn’t the most enjoyable job, especially if you work the graveyard shift. However, both were affable, and eager to help me overcome my indecisiveness about the best “snack” to purchase. After deliberating, and enjoying the lighthearted banter, I settled on Tic Tac mints. The exchange was so amusing, the next evening we returned, hoping to find the same clerks. This time, there were two men who were equally pleasant, but lacked the joie de vivre of the women. One of the reasons for our visiting Bullhead City was to check on several rentals overseen by Rich’s step-father, who’d been hospitalized since September. There’d been several issues with one of the renters – a woman and her two young daughter – so we prepared for a confrontation. Instead, we arrived to find them in the midst of moving out. The woman overseeing the move was a relative, dressed in a tank top with crude tattoos on her arms and chest, cigarette dangling from her yellowed fingers, and hair in a scraggly ponytail, emphasizing the blemishes and wrinkles on her face. Her looks, however, were deceptive. She was courteous, conscientious, and cooperative, working with Rich to identify issues with the rental (a double-wide mobile homes that’d seen better days), and discuss what needed to be done to lockup the property to prevent vandalism. In the property next door – also a rental owned by my father-in-law – lived a woman and her mother. They had six small dogs, four cats, and several cages of birds in their single-wide mobile home. While they obviously had way too many pets, it was hard to overlook their soft heartedness. They no doubt had to stretch their meager welfare and social security payments to provide for their furred and feathered companions. Research has shown that having purpose and meaning in life increases overall well-being and life satisfaction, improves mental and physical health, enhances resiliency, enhances self-esteem, and decreases the chances of depression. Whereas simply pursuing happiness doesn’t result in consistency of happiness. Many of the people we met during our trip had challenging lives, but they had meaning. We learned the woman who was helping moved the family from my father-in-law’s rental was an aunt who’d previously been instrumental in raising the mother. For the past eight months, she’d cared for the woman’s children who worked 45 minutes away. She explained how she’d walked the girls to the school bus stop every morning, and ensuring they had what they needed at night. The meaning of her life was to care for others. Perhaps the meaning for the next-door neighbor with the multitude of pets is to take in unwanted and abused animals. The shuttle bus driver at the Bellingham Airport found meaning in delighting his grandchildren with playful antics. Because a “giver” may have to sacrifice happiness in order to achieve meaning, they tend to experience more stress and anxiety than happy people. On the other hand, happiness without meaning can result in a person being shallow, self-absorbed or even selfish, continuously seeing ways to satisfy their needs and desires, while avoiding unnecessary entanglements. The Declaration of Independence states the unalienable rights of “Life, Liberty and the pursuit of Happiness.” Happiness isn’t guaranteed, just the freedom to pursue it. But like Hector in the Simon Pegg movie, a more satisfying goal might be to find ones meaning, and thereby, lead a more caring life. When I was six or seven, my aunt and uncle gave me a sterling silver charm bracelet. Over the years, I added charms whenever I visited interesting places. My mother often bought me several charms at once, and had several custom made. 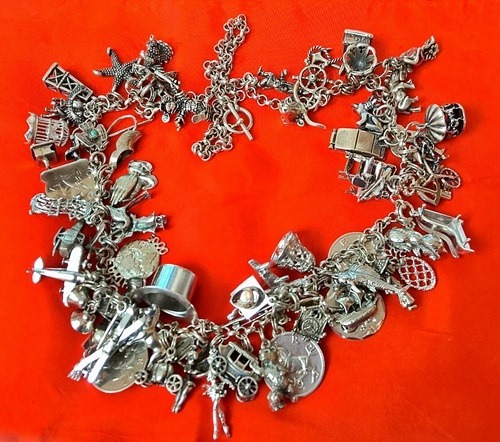 By the time I was an adult, the bracelet was so full of charms it was completely unwearable. A jeweler recommended I place the charms on a silver chain. She sold me the split rings, and gave me a tool, which made it easier to open the rings and attach the charms. I wore the necklace a handful of times, then stashed it in a ceramic pot in a display cabinet. I recently discovered the necklace, and was surprised at how random charms added in my teens took on meaning later in life. The original charm was a delicate horse, which continues to be one of my favorites. The charm of a longhorn is a very detailed with majestic horns. I placed is towards the back of the necklace because it lacked meaning. However, when I moved to Texas and saw longhorns, I was instantly captivated with these incredible animals, and subsequently quit eating beef. I also have a charm of an oil derelict, which may have been a prediction to Rich and me moving to Texas. I’ve always like rhinoceros so it’s no surprise I have a rhino charm. One of the first charms I received was a sailing vessel with multiple masts. It was created by a jeweler in Tarzana, California, and originally cast in gold. My mother asked to have it remade in silver. I have no idea how anchor and rope, starfish, swordfish, and boat wheel charms ended up on my bracelet. I don’t recall purchasing or receiving them. Unexpectedly, Rich introduced me to sailing, and I ended up getting bare-boat certified. One day, we look forward to owning a sailboat. Pineapple given to me by my grandparents who went Hawaii. My stepchildren grew up in Kauai, and Rich lived there for several years. Four charms that represent my parents’, brother’s and my astrological signs. Mortarboard with a pearl, given to me when I graduated from high school. Mortarboard inscribed with PSU (Portland State University) and the date I graduated. Two fairy charms. There’s a third, which I never placed on the necklace, and carry in a cloth bag in my purse. She’s a parking fairy who ensures I can find a parking space even when the possibilities are remote. Bird cage with a bird inside. Maybe it meant I’d marry a man with several birds. Frog with a crown. Rich turned out to be a prince, but in mortal skin. Helicopter. I’ve been in a helicopter twice, both as birthday gifts from Rich. Ballerina, bicycle, flip phone, and eagle kachina, which I definitely picked out! I can’t sing or play an instrument, but I guess to represent my cousins who are musicians, and my mother’s interest in playing the piano I have a piano, clef note, ornate series of notes, gramophone, and a man on a park bench playing a guitar (my mother thought it represented her lover holding a skis).